Piano with bench. 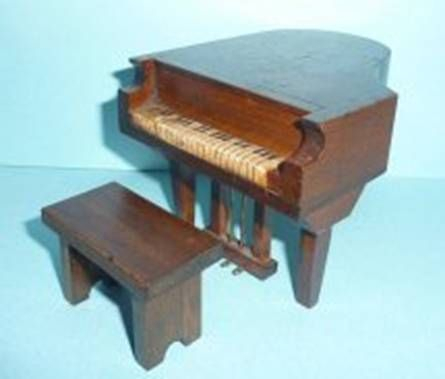 I consider this type of piano and bench part of the German "red stain" family, although this one is not marked and the stain doesn't have the traditional red to the stain. The piano measures 3 3/4" wide, 4 5/8" deep, 3 1/2" tall and still has all three little metal foot pedals as well as the paper keys (the keys have darkened some with age). The bench is 2 3/8" wide, 1 1/4" deep and 1 1/2" tall.